Wonderbag working hard at Everest Base Camp! Back at Base Camp, after 5 days of hiking down to Gokya, was a great feeling! Great to see Ongchu and the rest of the team, and in a weired way, back home to our base! However it was also back to the devastation and depression. Base Camp had virtually emptied and besides a few scattered Sherpa tents and what was left of other expeditions, not too many folks were left at base camp! Having returned alone, I again walked base camp, checked out the destruction caused by the avalanche. The litter of tents and equipment was spread out over base camp. So sad to see personal items and kit of those who had been worst affected lying everywhere. That afternoon, a meeting was arranged for those expeditions still left at base camp. The head of the Ice Doctors had returned and an expedition team with influence, Russell Brice and his Hymex Team, were all in attendance. Another team, still able to continue, was the Indian Army Everest Expedition. A decision needed to be made as to whether Everest would be opened again, or closed for the season. When Ongchu returned later that afternoon from the meeting, he signaled to me that a decision had been made and that Everest was now closed. Russell Brice and his team had made a call and were pulling out. The Ice Doctors were not keen to keep the icefall open for a handful of climbers. (Not forgetting that the icefall is not a once off task of securing ropes and ladders. It needed constant maintenance throughout the climbing season.) Individuals within the Indian Team were interested in continuing up Everest, but they were outvoted. The mountain was, within this meeting, now closed. All that remained was for the Nepalese Tourism Board to officially declare Everest closed for the season. The next day, when Sean and the team returned, Sean was still looking on the bright side. So positive and optimistic, Sean wanted to hear the answer from the Nepalese Government before making a decision to pull out. And there was another reason for this. Walking off the mountain voluntary may well compromise the opportunity to get reimbursed with the climbing permit fee. Remaining behind until the mountain was declared closed by the Nepalese Government, would strengthen the possibility of having the permit cost reimbursed. Next morning we got word that the Nepalese Tourism Board had declared the mountain officially closed. The Everest 2015 season was over! 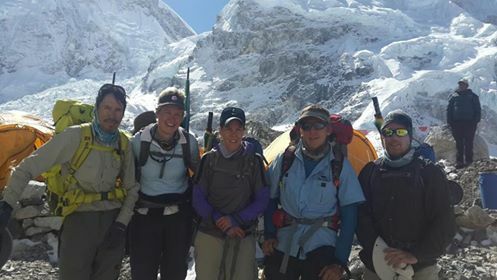 With the national death toll rising towards the 10 000 mark, and the fatalities on Everest now standing at 22, (18 at base camp, and 4 succumbing to injuries sustained), it was time to call it a day. With a definite answer having been received, everyone jumped into action and the camp was slowly dismantled. Each of us got cracking and packed our personal belongings. The Sherpa and Porter team would slowly pack up the rest of our camp over the next week or so. It was so sad to see our “home” being dismantled. The team had no set foot on Everest, and it was over! Next morning, the 6th May, we departed base camp. Anxious to get back to the comforts of the Hyatt Hotel, we set a blistering pace, with Namche Bazaar our destination. This was a 40km hike! As our altitude dropped and the air got thicker, we felt stronger! I, again, took my time and only got in that evening at 8.30pm, an 11 ½ hour hike! Hiking through the Himalayan Mountains at night, with hardly a light in sight was special. Amazingly enough, there were still porters out there, transporting goods up and down the mountains! Our next destination was Lukla, and we again tucked our ears in and made tracks for Lukla! 25km’s later and we entered the small village. Again Sean had gone ahead and on my arrival in Lukla, I could not find the teahouse where we were staying! Wandering the streets, I heard a loud knock on a window above me and there was Sean and the team, snug, and drinking beer shandy’s! Sean took a pic of me as I wearily looked for the entrance! A happy team now at our penultimate destination before home time! With air tickets out of Lukla booked for the first flights out, we were up at 5am the next morning and at the airport by 6am. With our flights booked for 7am, there was still concern that it would be delayed by weather, as had been when we flew in. However, right on time, our Sita Airline plane landed! Now for the take-off……! All seated and strapped in, the pilot revved the plane up, released the brakes and we accelerated on down the runway. There was no aborting take offs here. Once committed, it was up and away! Turning left we climbed out of the Khumbu Valley, destination Kathmandu! We landed in Kathmandu, at an airport full to capacity with foreign aircraft, all bringing in aid post the earthquake. Once through customs, we headed off to the Hyatt Hotel. On everyone’s minds was a long hot bath and a meal with a selection of food, including real meat and desert! That afternoon, our Camp 1 Sherpa, Kimi, came by the Hyatt to visit us. He was on crutches and had broken his leg badly, just below the knee. He would be out of action for the next 10 months, and Everest Camp 1 and 2 were off the cards for some time to come! The next 2 days were spent shopping and sorting out our kit for the flight home. Later that day, Sean and I boarded a Mango flight for our home in Durban! Waiting for us was our respective families, happy to have us back home after 7 weeks away! I was stoked to be home, that familiar territory feeling of HOME!! An epic adventure, one that none of us had vaguely anticipated! Although Everest had not been climbed that season, we had survived an earthquake and avalanche at Base Camp! We had a story for our grandkids one day! Ending, may I take this opportunity to thank a few people. Nico, Wilmien and Molly; you were a pleasure to be with! We really were a team and I was proud to be a part of it. To my family, Belinda, Daniel and Jenna; thanks for your understanding and support on my quest to spend time at Everest. It was a goal of mine and you gave me your blessing to achieve it. To the rest of my family; Donald who assisted me with the Edge business whilst I was away. My sister Alison, always there to support me and my family. 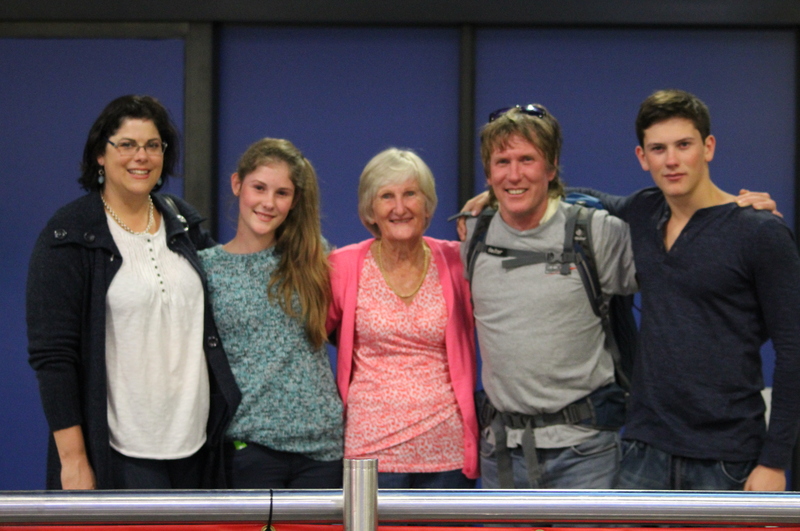 My parents; sorry to have to put you through another epic adventure, but that’s me….! And to all our friends who supported me and especially for the support you gave Belinda and the kids during the tough times when uncertainty around my safety was questioned. I really appreciated the support. And lastly to the men and women who make climbing Everest possible; the Sherpa community of Nepal and the Khumbu Valley. The unsung heroes of Everest, you have my respect and I salute you!! Thanks for sharing Rob! As someone who fell completely in love with Nepal and their people, I am totally envious of your experience …..excluding the Avalanche of course!!! !